Cardigan Golf Club on Wales' southwest coast is a fine hidden gem links golf course that's extraordinarily fun to play. The club was originally established in 1895, though the course moved about a mile to its present day location in the 1920s. Cardigan is set on a cliff top overlooking the sea at every turn. From most points, you can see Cardigan Bay, the River Teifi estuary and the Preseli Hills in the distance. The course features firm, rolling fairways filled with gorse and tall heather you might find in a down land links. Cardigan is a bit out of the way, farther north compared to Royal Porthcawl, Ashburnham and Celtic Manor, but has a lot of selling points for visitors. These include a very affordable green fee (25-35 pounds) and a course that finishes spectacularly. 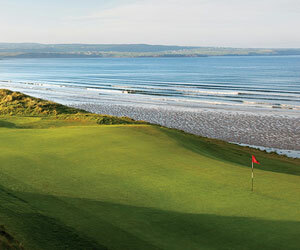 Cardigan Golf Club plays high above the sea and is more wide open than some other Wales links. A view of Cardigan Golf Club in south Wales. Cardigan features firm, rolling fairways. There are great views from just about anywhere on the course at Cardigan Golf Club in south Wales. The downhill 15th hole at Cardigan Golf Club is a long, tight par 4. Cows rest to the side of the 15th hole at Cardigan Golf Club. A view of the par-3 16th hole at Cardigan Golf Club in south Wales.